March 8, 2011, Washington, D.C. — A new public opinion research report finds that an overwhelming majority of Americans believe the nation’s retirement infrastructure is crumbling and that stock market volatility makes it impossible to predict retirement savings. Download Research here. Download Press Release in PDF here. View CNBC coverage of the report here. When it comes to retirement, Americans continue to have high anxiety. An overwhelming majority of Americans are anxious about their retirement prospects. Some 84% are concerned that current economic conditions are impacting their ability to achieve a secure retirement, with more than half (54%) of Americans very concerned. This level of anxiety has not dissipated, with 83% of Americans in 2009 reporting retirement concerns. Americans have low retirement expectations. Americans consider a secure retirement simply surviving or living comfortably (34%), paying their bills (17%), and maintaining their pre-retirement lifestyle (11%). Only 11% expect retirement to include leisure, travel, restaurants, and/or hobbies. Moreover, Americans are taking a number of actions to improve their retirement prospects—saving more, getting rid of debt, delaying retirement, or looking for jobs with a pension. The U.S. retirement system is under stress and in need of reform. Nearly 9 out of 10 Americans believe the retirement system is under stress and needs to be reformed. More than 80% of Americans believe that recent economic downturn exposed the risks of America’s retirement system. Nearly three-quarters of Americans believe that stock market volatility makes it impossible for the average American to predict how much money they will have in their nest egg when they retire, underscoring the flaws of the current retirement system. Washington is disconnected from Americans’ retirement anxiety. Nearly 80% of Americans believe leaders in Washington do not understand how hard it is to prepare for retirement in this economy. Some 83% say government should make it easier for employers to offer pensions, and 81% believe that Washington leaders need to give a higher priority to ensuring more Americans can have a secure retirement. “This report makes it clear that Americans understand we’re on the verge of a retirement breakdown. For decades, large shares of Americans had access to a ‘three-lane highway’ to retirement security: a pension, Social Security, and individual savings,” said Diane Oakley, NIRS executive director. “This year, as the first of some 78 million Baby Boomers turn 65, they are experiencing a road to retirement that is shaky and full of potholes. The research indicates that the American people need and want relief from their retirement anxiety,” Oakley added. The high level of retirement is not surprising in light of the fact that the median household headed by a person aged 60 to 62 with a 401(k) account has less than one-quarter of what is needed to maintain its standard of living in retirement. Additionally, pensions are disappearing in the private sector, and public sector plans are undergoing modifications to contend with the impacts of the financial crisis felt by all investors. Further, Social Security benefits are decreasing, while talks of more cuts via raising the retirement age continue. Also noteworthy is that the findings indicate that Americans view pensions as a solution for relieving their anxiety. Yet, many also believe that leaders in Washington do not place enough attention on implementing solutions to improve retirement prospects. The opinion research is intended to provide information to policymakers and other stakeholders to help guide effective public policies. It was conducted by Mathew Greenwald & Associates as a nationwide telephone interview of 800 Americans age 25 or older to assess their sentiment regarding retirement and actions Congress and Administration could take. The data was balanced to reflect the demographics of the United States for age, gender, and income. The margin of error is plus or minus 3.5%. ABOUT NIRS The National Institute on Retirement Security is a not-for-profit, non-partisan organization established to contribute to informed policymaking by fostering a deep understanding of the value of retirement security to employees, employers, and the economy through national research and education programs. 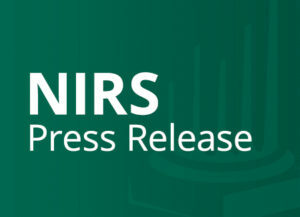 Located in Washington, D.C., NIRS has a diverse membership of organizations interested in retirement security including financial services firms, retirement plan sponsors and service providers, trade associations among others. More information is available at http://www.nirsonline.org.